“The reckless, the degraded, and the vicious”: Was Darwin a Bigot? With savages, the weak in body or mind are soon eliminated; and those that survive commonly exhibit a vigorous state of health. We civilized men, on the other hand, do our utmost to check the process of elimination; we build asylums for the imbecile, the maimed, and the sick; we institute poor-laws; and our medical men exert their utmost skill to save the life of everyone to the last moment. There is reason to believe that vaccination has preserved thousands, who from a weak constitution would formerly have succumbed to small-pox. Thus the weak members of civilized societies propagate their kind. No one who has attended to the breeding of domestic animals will doubt that this must be highly injurious to the race of man. It is surprising how soon a want of care, or care wrongly directed, leads to the degeneration of a domestic race; but excepting in the case of man himself, hardly any one is so ignorant as to allow his worst animals to breed. The passage is from the fifth chapter of The Descent of Man, published in 1871. The scientist who so impresses me with his vision of the common struggles of all species, humans included, sounds like a hard-core racist here. The comparison to animals reinforces the impression. The final two sentences seem horribly emphatic. The Social Darwinist movement that grew from Darwin’s ideas, a movement that fostered both American sterilization of the mentally deficient and the Nazi genocide, seems to have taken its cue directly from the great scientist himself. Lots has been written to defend Darwin here; his contemptuous attitude was characteristic of his social class at that time, and so forth. But still. 1950, North Carolina. 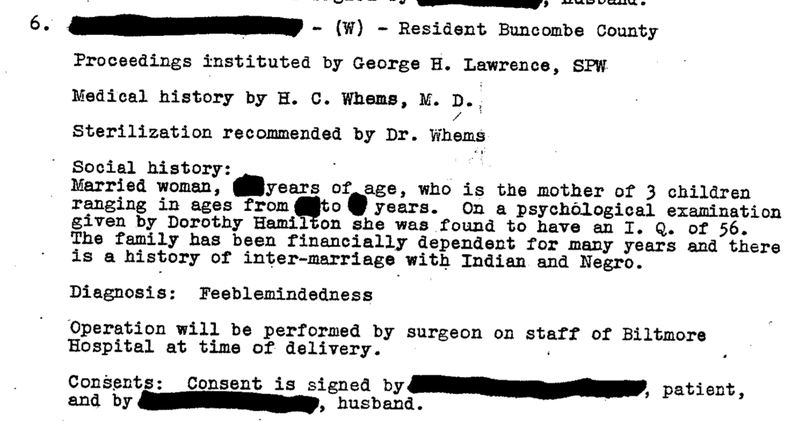 Board approval for the sterilization of a “feebleminded” woman. What would Darwin say? But if we look more closely at the chapter where the passage appears, we might feel, if not comfortable with it, at least less revolted. 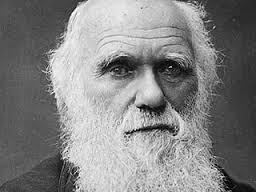 The second and third sentences—about medicine, asylums and other social efforts to help the poor and ill—are part of Darwin’s argument throughout the chapter that human sociability, inherited from animals, is the foundation of our most civilized achievements, including human closeness, compassion, and morality. And a few sentences after the passage above, Darwin writes, “If we were intentionally to neglect the weak and helpless, it could only be for a contingent [possible, uncertain] benefit, with an overwhelming present evil.” In other words, we would lose more—our morals—by abandoning our scruples and ignoring those who suffer than we might gain by reducing the numbers of the poor and sick. This point certainly has relevance today. Think of the debates over whether government should actively help the poor or whether, on the other hand, it should assist as little as possible and let the poor sink or swim. Darwin’s position would probably be that even at the risk of encouraging some dependence on government, in the long run our society will benefit the most—will “advance” the most—by acting compassionately. Still, there is a problem. Among all species, Darwin argued, evolution favors those who have the greatest number of surviving offspring. It’s a matter of hard numbers. Among the people who live in “civilized societies,” those who are poor and “reckless” marry earlier and collectively have more children than members of the higher, “virtuous” classes who are careful of their resources, marry later and have smaller families. So, why haven’t the children of the poor taken over society? Because, Darwin wrote, natural selection is not the only force at work. It is “checked”—modified—in many ways. The offspring of the poor are fewer than one might expect for several reasons. The poor die young, relatively speaking, especially if they are unmarried males or if they migrate to the living conditions in cities. And although many of the poor have large families, those who are very, very poor have few children. Darwin’s controversial passage is shocking, I think, because he is describing the tension over whether and how to assist the unfortunate in the sharpest and starkest terms. On the whole, I don’t think the debate has shifted fundamentally. We agree with Darwin that high rates of poverty and disability are “highly injurious” to humanity in that any nation with such conditions is a degraded and dismal place to live. And like Darwin, we feel that the moral imperative for social action, despite imperfect results, is not one we can permanently ignore. This entry was posted in Cooperating and competing, Surviving and thriving and tagged Darwin, Descent of Man, eugenics, racism, Social Darwinism, sterilization. Bookmark the permalink.